It’s time to get ready for all the little ghosts and goblins. With cookie stencils you can decorate some special treats and get your Halloween crafts off to a great start. Like I always say, stencils make putting pictures in difficult places much easier. Painting images on cookies was a challenge for me (especially because I’m no Betty Crocker). I tried every complicated and expensive method I could think of only to meet with disasters. I must have gained 20 pounds eating them all, too. Well, I wasn’t going to let all those cookies go to waste. Finally I tried a simple, no fuss, use stuff already around the house method and guess what? It worked. So here is how I “painted” with cookie stencils for Halloween (but you can use the same process for any occasion cookies). Oh yeah! Don’t miss out on the hints and tips I’ve added at the bottom for some great creative ideas. First, I drew up some scary Halloween stencils and sized them perfectly for a normal size cookie stencil. They are a witch, a ghost, a cat, a bat, a skull and a spider (pictured above). If you want to use these cookie stencils, you can find them at Printable Halloween Stencils. They can be printed right there at your computer. Of course, you can draw your own too. 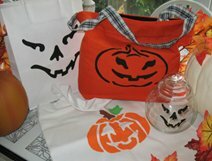 Another option is to search on the web for some printable Halloween stencils. It’s best to locate a stencil that is a single overlay design (that means it’s finished with just one sheet or layer). If they are not the right size to fit on a cookie just re-size them on a copy machine and follow these next steps. Trace the cookie stencils onto a sheet of stencil film such as acetate or mylar. Make sure the images have approximately 2 inches between them. Use a scissors to cut the traced drawings separate of each other with 1 inch of blank space surrounding them. Use a craft-knife to cut out the objects of each cookie stencil. You have several options for craft-knives. I prefer to use an X-ACTO with a Fine Point Blade. Make sure your blade is sharp at all times or you won’t get a good clean cut. I find it’s easier to rotate the stencil so that you are always cutting with your wrist at a comfortable angle. Since you are working with food, wash your cookie stencils really well and dry thoroughly. Pssst! I added a few more Halloween Craft ideas for you using some free Pumpkin Stencils just like in the photo, so don't miss out! Bake cookies with your favorite recipe. Since I already admitted that I’m not a baker, I’ll let you know that I used the boxed up ready to go version where you just need to add an egg. But if you are a skilled chef, go ahead and make your goodies from scratch. Sugar cookies work best because they have the smoothest surface after baking. A cookie with too much texture is not going to produce a good stenciled image. I like to slightly flatten the tops of the cookies right after they come out of the oven with a spatula. If the stencil can lay flat on the cookie you’ll get a much better image than if it has to roll over rounded edges. Let the cookies cool. Prepare your “paint” by adding water to powdered sugar. You want to get a thick consistency that is very smooth. It doesn’t take very much water. The mixture should not drip easily off the end of a spoon. Make colors by adding food coloring. Create black with equal drops of green, red and blue. Carefully remove the stencil by pulling directly up. You don’t want to drag the stencil over the wet color mixture which will smear the color. It might take a little practice but remember you get to eat the mistakes. You may want to make a different size cookie than the normal 2-1/2 or 3 inch circle. No problem! Just take the paper copy and reduce or enlarge the size to fit the area you want to place the picture. Then move on to the tracing. This is great if you want to make a large cookie cake too! When you are cutting out the images for the stencils, don’t throw away the parts that you cut away. They can be used to make negative images on the cookies. Of course, it’s a bit trickey to remove the stencil piece after you have put the color all around it but with a little practice you can have this down to an art. And just think of the creative cookies you can come up with using these new options. If you use a recipe for a highly textured cookie, like oatmeal or chocolate chip, you can put a base layer of powdered sugar and water to create a very smooth area and then stencil your image on that. Actually that can just add to how creative you can be with decorating cookies with stencils. For example, you can put a background of a black circle on top of the cookie behind a white ghost. Make sure that the first layer of color has dried thoroughly before adding your image. If you can’t find mylar or acetate at your local craft supply store, try transparency films at an office supply house. Just make sure that the material will accept pen or ink so that you can trace on it and that it will be safe to use with food items. Also, you have a large number of suppliers of stencil films on line. Well, I hope that by now you are comfortable enough with using a cookie stencil to give it a try. It’s a great Halloween craft to get the kids involved too. I can’t think of a better craft project than one you can eat! Well, Happy Halloween and Happy Stenciling! In an effort to bring to you a complete solution for all of your stenciling needs, we now have a catalog for you to browse a large variety of designs. So, check out our Stencils Catalog for your next project. But if you'd rather have your Stencil Pattern Books in Print then visit our Printer's Book Shop for a large variety of stencil collections. These books are easy to follow and come with complete instructions. You'll find all of the stencil designs used as samples throughout this site. 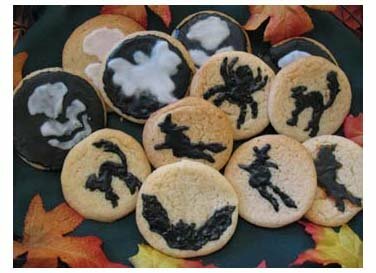 Return to Home Page from Halloween Cookie Stencils. Return to Halloween Crafts from Halloween Cookie Stencils.